A wide range of Digital Units are available, covering Inputs / Outputs / Counters / AC type / DC type + many more. Isolated Digital Output Module (Open Collector - needs input from external power source, single ended channels). Non-isolated Digital Output Module (Open Collector - Single ended channels, with the power to the contact taken from Power Input connection). Isolated digital input and output module (single ended inputs - needs input from external power source). The I-7050 digital input/output module has 7 non isolated digital input channels for logic inputs and 8 open collector outputs. The I-7052 digital input module has 8 isolated digital input channels for logic inputs. The I-7053 digital input module has 16 dry contact digital input channels. The I-7060 unit provides 4 channels of Power Relay Output (2 with Form A relay, 2 with Form C) and 4 channels of isolated Digital Input. The I-7060D unit provides 4 channels of Power Relay Output (2 with Form A relay, 2 with Form C) and 4 channels of isolated Digital Input. This "D" variant also provides channel status LED's. The I-7063 unit provides 3 channels of Power Relay Output (Form A relay) and 8 channels of isolated Digital Input. The I-7065 unit provides 5 channels of Power Relay Output (Form "A” relay SPST (N.O.)) and 4 channels of isolated Digital Input / 16-bit digital counters. The I-7065D unit provides 5 channels of Power Relay Output (Form "A” relay SPST (N.O.)) and 4 channels of isolated Digital Input / 16-bit digital counters. There are LED status indicators for all channels. The I-7065BD unit provides 5 channels of SSR-DC Relay Output and 4 channels of isolated Digital Input / 16-bit digital counters. There are LED status indicators for all channels. The I-7067 unit provides 7 channels of Power Relay Output (Form A SPST relay). The I-7080 module provides 2 Counter/frequency channels with a choice of either Isolated or non-isolated inputs. 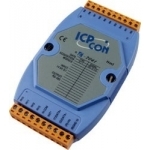 The non-isolated inputs have programmable Logic levels. Two Digital Outputs are also provided for alarm purposes. The I-7080D module provides 2 Counter/frequency channels with a choice of either Isolated or non-isolated inputs. The non-isolated inputs have programmable Logic levels. Two Digital Outputs are also provided for alarm purposes. A 5-digit LED readout is also provided. Dry Switch Indicator/ContinuityModule The Measurement Systems designed S-7551 Dry switch indicator/continuity module can detect volt free contact closures.